Bialowieza Forest comprises over 140,000 hectares on either side of the border dividing Poland from Belarus. Its uniqueness lies in that it is the last well-kept stretch of European primeval lowland and deciduous forest, providing home to plenty of rare plants and animals. 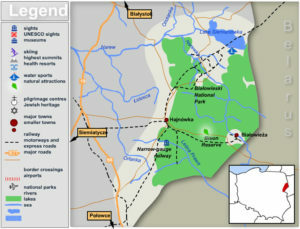 The most abundant part of the forest is within the Bialowieski National Park, located right in the middle of the forest deeps. Due to its global significance, UNESCO included Bialowieza Forest on the World Biosphere list and on the World Heritage register, plus it was recently awarded a European diploma. 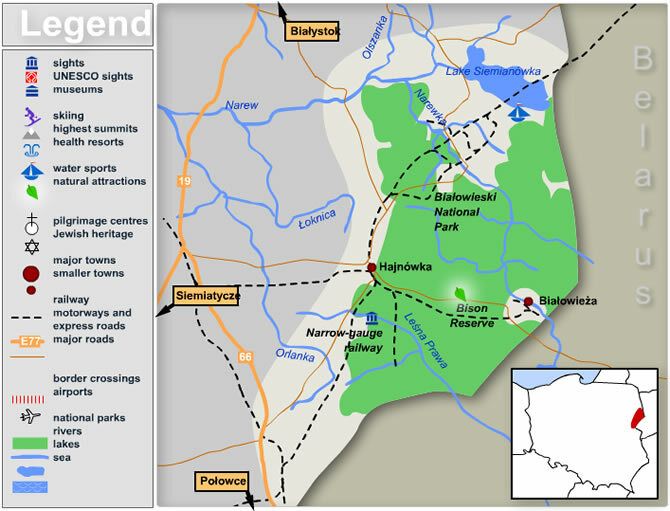 Today Bialowieza Forest is perhaps best known as forming an enclave for the European bison. The attempts to rescue this huge mammal, once a common sight there, were crowned with success in 1952 when the first specimens were released back into the wild. The village of Bialowieza is located about 260 km from Warsaw, an easy distance by car, bus or train. You may also wish to take a taxi if time is limited, as this will let you see more and get to places you otherwise might not find. The road route is: Zabki – Zielonka – Radzymin – Wyszkow – Brok – Ciechanowiec – Bielsk Podlaski – Hajnowka – Bialowieza (approximately 210 km). As there is no direct bus service from Warsaw to Bialowieza, it is best to take one to Bialystok and there change for a bus to Bialowieza (distance: 111 km). If you go by train, take the one heading to Hajnowka. Once there you can choose between a bus and taxi to Bialowieza (distance: 18 km).